Paul, Minn., and T r a n s l o a d & Transport, Inc. (TTI) of Morgan City, La. With headquarters in Morgan City, the company is also opening sales offices in Houston, Texas, and in Baton Rouge, La. In making the joint announcement, Kenneth Dunagin, TTI presdent, and John W. Lambert, TCB president, said the freightment corporation will take delivery of 11 s p e c i a l i z e d 1,400-ton tank barges with double skin construction. The vessels are built to carry petrochemicals and water white products, including all products regulated by Sub-Chapter 0. Wayne Musgrove said the fleet is expected to provide "a major chemical transportation company t o s e r v e the Gulf (of Mexico) coastal area." The Houston sales office will be headed by Larry Musgrove, formerly employed by Zigler Shipyards, a division of Lee-Vac, Ltd.
Bob Hougland moves to Baton Rouge to head the sales operation there from St. Paul, where he served as director of administration and development for Harcon Barge Company. Serving the Chem-Marine board of directors in addition to Wayne Musgrove, Mr. Dunagin, and Mr.
Lambert, will be William L. Lusk, now a TCB vice president. In addition to heading up Chem- Marine, Wayne Musgrove is also the owner of Musgrove Marine, Inc. and Robinhood Shifting & Fleeting Services, Inc. He is part owner of Claiborne Island Marine Service, Inc. All the corporations owned by Wayne Musgrove are headquartered in Morgan City. 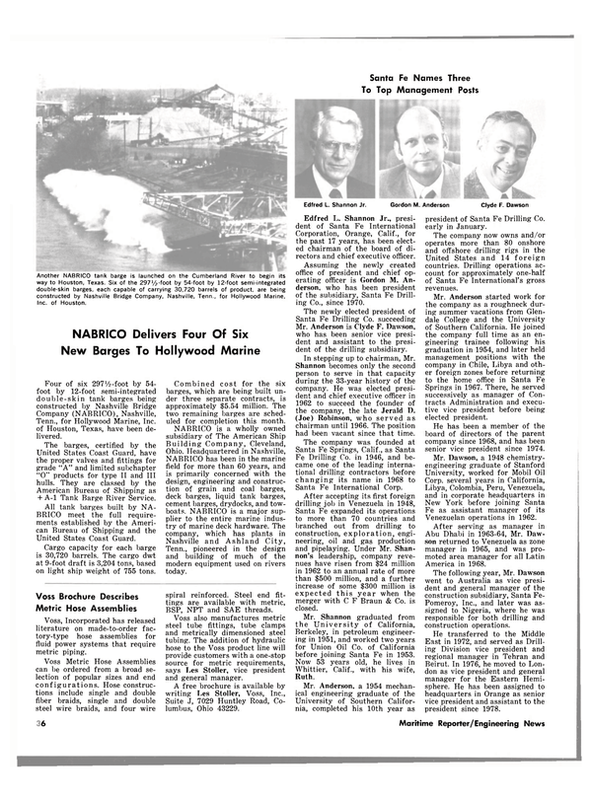 Before organizing his own companies beginning in 1976, Wayne Musgrove worked for Lee-Vac, Ltd., where he held various positions including v i c e p r e s i d e n t, M a r V a c G u l f , Gateway Barge Line, Domar Ocean Transportation, and Zigler Shipyards (all Lee-Vac subsidiaries). Earlier in his career, he gained experience as a salesman/pilot/ w i r e l i n e o p e r a t o r for Schlumberger, petroleum reservoir engineer for Core Lab, Inc., and as a mud engineer and pilot for Intracoastal Liquid Mud. Mr. Dunagin, in addition to the presidency of TTI, is owner of K-D Marine, Inc. and part owner of Claiborne Island Marine Service, Inc. A former coach and teacher and former Lee-Vac, Ltd.
executive, Mr. Dunagin is a native of Decatur, Miss. In addition to the experience gained as chief executive officer of TCB, Mr. Lambert brings to the Chem-Marine board experience as officer and/or director of Twin City Shipyard, Inc., United Coal Sales Co., Twin Tech Oil Co., Houston ; Packer River Terminal, Inc., and River Logistics. Mr. Lambert is also a member of the executive committee of the Upper Mississippi Waterway Association, and a former director of the Public Affairs Committee of American Waterways Operators, Inc. He is the author of a volume entitled "The Economic Impact of Waterborne Transportation on the Upper Mississippi River Basin." Larry Musgrove, a Beaumont, Texas, native, brings to the Houston sales office extensive experience. Before beginning his tenure with Zigler Shipyards, he worked with a drafting and engineering firm in Houston. Mr. Hougland brings to the Baton Rouge sales office a lifetime of experience in the "inland towing industry," where he "worked in all phases from making rigging to pilot work." During earlier employment with TCB, Mr. Hougland worked extensively in the movement of liquid products ranging f r om petrochemicals to asphalt. His experience also includes operations, sales and marine program development. In addition to his most recent TCB assignment, he has also served as vice president of operations of United Coal Sales and as president of Rochester Dock Co.